Nicolas Cage’s nearly-pristine copy of Action Comics No. 1 featuring the first appearance of Superman sold for a record $2,161,000 in an online auction that ended Wednesday. It is the first comic to sell for more than $2 million at auction. The previous record was $1.5 million for a less well-preserved copy of Action Comics No. 1 sold in March 2010. Cage's comic was stolen from his home in 2000 and only recovered in April when an unidentified man bought the contents of an abandoned Southern California storage locker. Few comics have as interesting or complicated a back story as Cage’s copy of Action Comics No. 1. Certified Guaranty Company, the leading grader of the quality of collectible comics, recently assigned this copy a grade of 9.0, making it the highest publicly-graded copy of Superman’s first appearance. Approximately 100 copies of Action Comics No. 1 remain in existence. Experts believe only about five others, all in private hands, are of near-equal quality to Cage's copy and only one -- the legendary "Edgar Church Collection" copy, which has never been publicly viewed -- might exceed it. Cage's Action Comics No. 1 first created a stir when an obscure collector brought it to public attention by consigning it to auction at Sotheby's in 1992. The sudden appearance of a previously unknown high-grade copy of such an important comic is a rare occurrence. 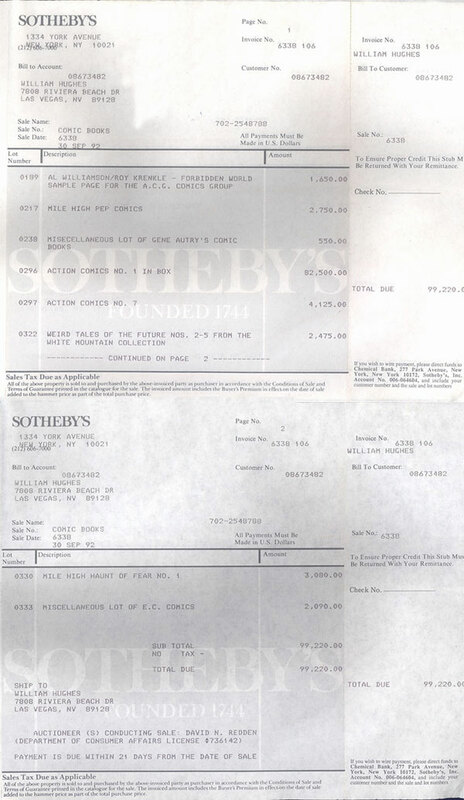 Sotheby's sold it for a then-record $82,500. Cage bought it in 1997 for about $150,000. On January 21, 2000, Cage reported the comic stolen to the Los Angeles Police, along with high-grade copies of Batman’s first appearance in Detective Comics No. 27 and Marvel Mystery No. 71. According to an account Comicconnect CEO Stephen Fishler posted on a collector’s website, Cage had the books displayed in security frames mounted to the wall. The exact moment of the theft is unknown but the comics had possibly been missing for a week when Cage discovered the frames were empty. The Marvel Mystery resurfaced a few months later but the other two comics remained lost. 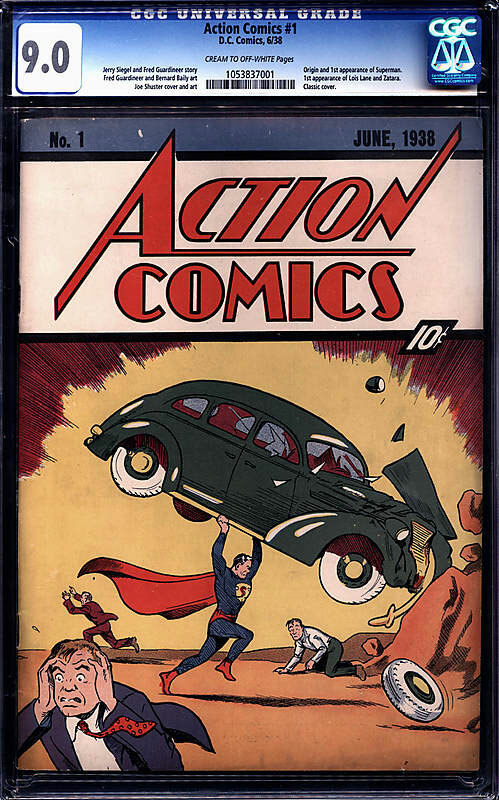 In April 2011, Cage’s copy of Action Comics No. 1 was recovered in a San Fernando Valley storage locker. The man who found the comic had bought the contents of an abandoned locker. Cage’s publicist released a statement from the actor at the time calling the recovery of the comic "divine providence" and expressing hope "that the heirloom will be returned to my family." Cage had received an insurance payment for the comic but at the time expressed interest in reaching a settlement to regain ownership of the book. The missing Detective Comics No. 27 has never been found. Fishler would not confirm this is the Action Comics stolen from Cage but the provenance of the comic -- from its sale in the early 1990s to its theft in 2000 -- matches the history of the Cage comic. Comicconnect is selling it for the current owner, which is still believed to be Cage. Earlier, several websites devoted to comics speculated that this is the copy of Action Comics from Cage's collection. Representatives for Cage did not respond to a request from The Hollywood Reporter for comment. Despite the record price for Cage's copy other Superman memorabilia fetched more modest prices. For those interested in owning a piece of history, single pages from Action Comics No. 1 in fair condition could be had for about $300 and one of Superman co-creator Jerry Siegel's "favorite shirts" sold for just $51.